Cost: $30 per scout. Lunch included. Bring: Completed authorization form, warm clothes. Note: This event always fills. Register early. Marksmanship Day is a Council-led event with BSA trained supervision at a BSA facility range. Two different sessions are available on November 1st. More information and registration are available at the council's webpage. Be sure to wear your Class A uniform ! Cost: $20 per scout, $5 per adult. Lunch included. The Cub Scout Academics and Sports Program is an optional program for all Cub Scouts. Its purpose is to encourage the Scouts in learning new skills, or improving one they already posses. Cub Scouts can earn belt loops and pins in 25 academic areas and 28 different sports. 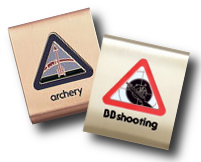 Among them, the shooting sports loops and pins (Archery and BB-gun Shooting) can only be earned through Council-led events, under BSA trained supervision, and at a BSA facility range. Marksmanship Day is one of such Council events and the next one is coming up on January 10th. Registration can be made online at the Council website. Be sure to wear your Class A. 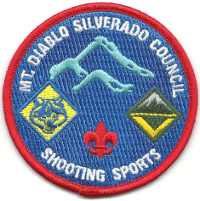 Note: Shooting sports belt loops can be used toward Wolf electives 20c and 20n, part of Bear requirement 23c and Bear electives 20. Cost: $20 per scout, $5 per adult. Lunch included. $5 late fee per person after September 30th. Marksmanship Day is one of such Council events and the next one is coming up on October 19th. Registration can be made online at the Council website. Make sure to wear your Class A. And special this year, JOTA will be held on the same day at the same site! So you can attend two events in one trip. Detail and registration info will be coming soon. Stay tuned! Cost: $20 per scout, $5 per adult. Lunch included. $5 late fee per person after August 5th. Marksmanship Day is one of such Council events and the next one is coming up on September 15th. Registration can be made online at the Council website. Make sure to wear your Class A. Cost: $20 per scout, $5 per adult. Lunch included. $5 late fee per person after September 17th. Bring: Completed authorization form. Warm clothes. Marksmanship Day is one of such Council events and the next one is coming up on October 8th. Registration can be made online at the Council website. Make sure to wear your Class A and fill out the authorization form before you go. Note: Shooting sports belt loops can be used toward Wolf electives 20c and 20n; and part of Bear requirement 23c. It was a cold and foggy morning last Saturday, but Camp Herms was packed with excited Cub Scouts awaiting for the start of Marksmanship Day. Our pack has 14 scouts attended the event. 3 in archery. 11 in BB-gun shooting. 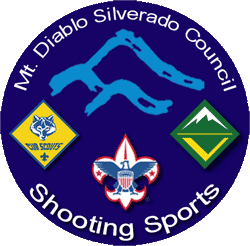 After 4 hours of training and practices, the scouts learned a lot about safety and techniques in shooting. In the end, everyone did a great job and earned a patch, a belt loop, and a pin. Congratulations especially to Josh K and Brian L for their exceptional work and receiving a nice jacket as reward. BIG THANKS to Ammy for taking pictures and uploading them to the Pack photo site. Other parents with pictures, please upload and share with us too. Thank you. Permission form: No cubs allowed to shoot without this form filled out! Print it now and bring it to the range. Class A: This is for the safety of your child. Wear it, or your child won't be allowed to shoot. Be on time: Registration starts at 7am and 11am for AM and PM sessions respectively and ends when shooting starts. Be there early. Paperwork: Make sure to bring back paperwork for any belt loops or pins earned. Your Awards Chairs will need them to purchase the awards at Scout shop. Spring 2011: Adult Shooting Sports Awareness - a special adult only event where adults are taught to shoot Archery, BB gun, Black powder, Rifle, Shotgun & Pistol. Marksmanship Day is one of such Council events and the next one is coming up on October 2nd. Registration can be made online at the Council website until September 26th (this Sunday). Go to the website for detail. Make sure to wear your Class A and fill out the authorization form before you go. Note: Shooting sports belt loops can be used toward Wolf electives 20c and 20n.